This is the first truffle of the 2010 New Zealand season, the first ever found in the Marlborough region, and a first for Marlborough grower Michael Hyson and his Waihopai Valley truffière. It’s nowhere near ripe yet, but as Michael exclaimed when he rang me with his news yesterday morning, “Gareth, it’s huge!”. 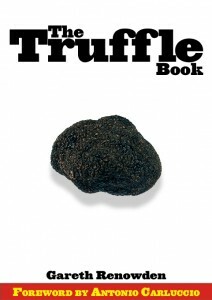 And it is at least big — that scale is in centimetres, so the top of the truffle is about 7 cm across. The very slight reddish tinge to the surface is typical of immature melanosporum, and Michael reports that the flesh (seen through a nick in the skin) is still white. That skin damage and the fact that it has grown out of the soil surface means the chances of it surviving through to full ripeness (probably late June/early July — around three months) are poor, but where there’s a big one, there’s almost certainly more. The Hyson family’s trees are eight years old. I hope their success is echoed in other young truffieres around the country in the coming season. I also have my fingers firmly crossed for this year’s harvest at Limestone Hills. At the beginning of the week I was pretty certain that I’d found a couple of “push ups” — where the soil surface cracks open as a truffle grows rapidly underneath — but I resisted the temptation to check on progress because one slip with the trowel, and the truffles might never ripen.